The last month has seen the Group concentrate on the layout wiring, in particular, the control of the storage yard point motors and the wiring of the end modules. 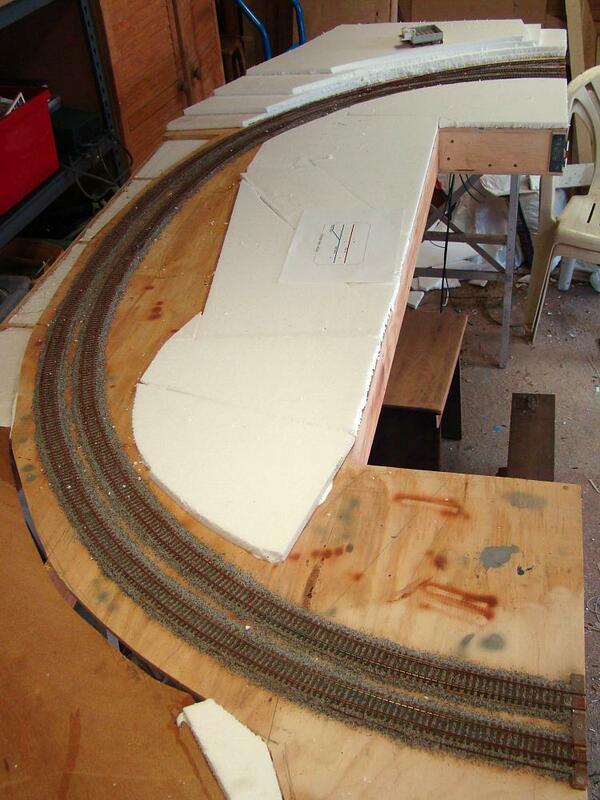 Scenery has also been started on the end modules, with layers of styrofoam glued in placed and shaped to form. One of the end modules, showing the scenic base. 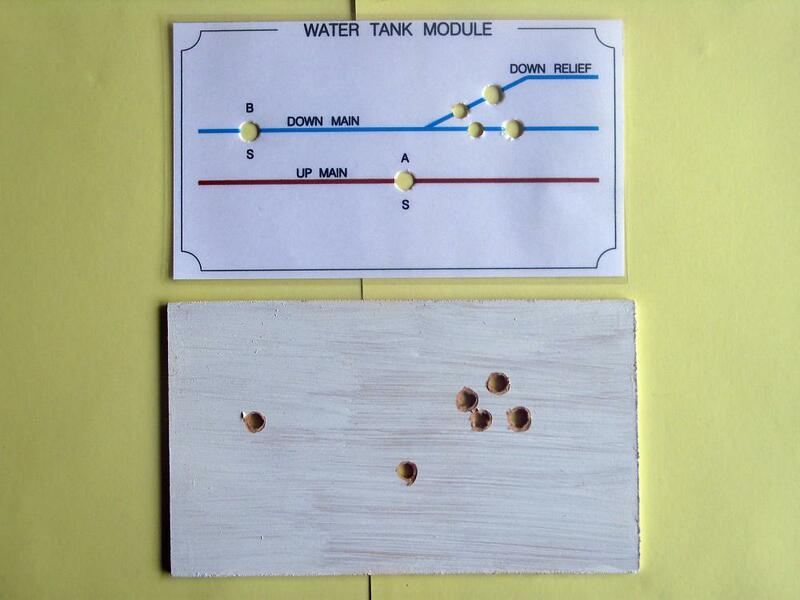 Parts of the 12mm (1/2 inch) plywood top have been cut out to reduce weight, with styrofoam inserted or placed over the top and held in position by white glue. Once the glue is dry, additional layers of foam can be added where necessary, and the edges shaped to form the contours of the scenery. The circuits which will control access to the tracks in the two seven-track storage yards have been finished. 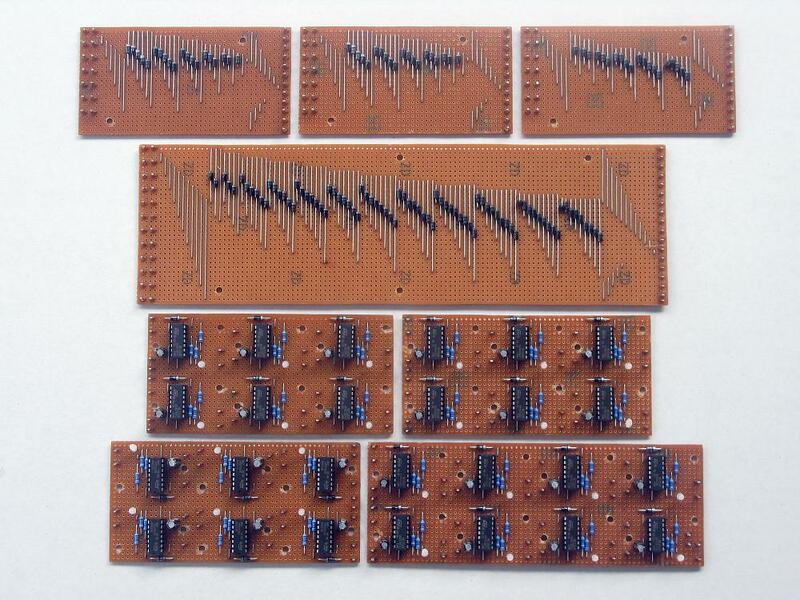 Four point motor driver boards (three driving six motors, one driving eight motors) have been finished and tested. The fourth diode matrix board, for the yard ladder having connections to both the Up Main and the Branch, has been completed. Eighty-three diodes are required to allow the ability to run trains either onto the Main or onto the Branch, with up to ten points needing to be aligned, depending on the route. This matrix board will also control the Up Main/Branch crossover located on the adjacent end module, meaning that only one pushbutton on the yard's control panel still needs to be pressed for either branchline or mainline running of a train. The eight circuit boards that will control the storage yard point motors. The top four boards are the diode matrix circuits, used to control which points need to be thrown, and in which direction they need to be thrown, when a storage yard track is chosen. The outputs from each matrix connect to one of the bottom four boards, the point motor driver circuits, which then provide the correct voltages to the Tortoise point motors. Control panels for each of the end modules were designed and assembled. Two wooden shelves were constructed to mount the panels and to provide a place to hold a beverage of the operator's choice, usually a nice hot cuppa. These shelves have been fitted, with one panel wired into one module. This module has also had the backdrop fitted, and is currently awaiting full electrical testing. The control panel for the other end module is partially wired, with only the track block feeds and point control wiring to be soldered to the switches. 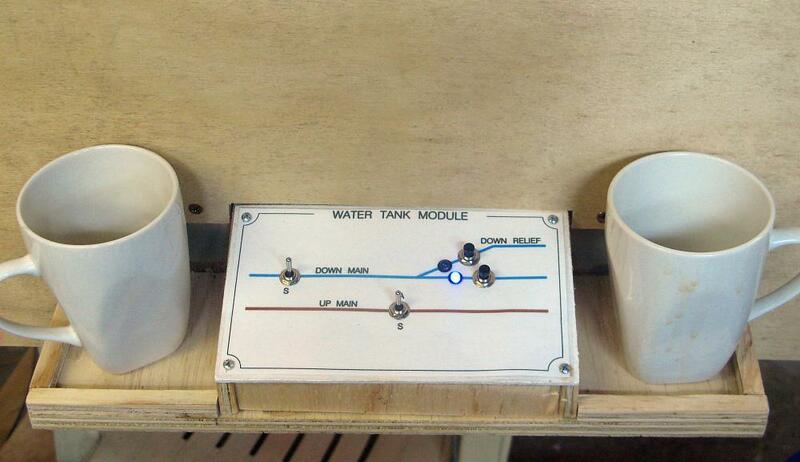 A simple but effective control panel being built from laminated paper and wood. Once designed and printed, the paper and the laminate sheet were cut to size before being laminated together, and the holes for the components punched out. Matching holes were drilled in the 3mm (1/4 inch) MDF base, which was given a coat of white paint to disguise the clear laminate edges. The control panel installed, wired, and ready for service.